Generation 1 SPOT Personal Satellite Tracker! In February of 2010, my buddy Don who at the time was living in Vancouver, introduced me to the “SPOT”. He explained what it did, why he liked it, and I really thought at that time that it was a pretty good device. In March, I went ahead and ordered one. This would be the first generation model known as the “SPOT Personal Satellite Tracker”, which is the one pictured above. With the Gen 2 spots just hitting the market, I got a really good deal on mine for all of around $25 dollars. The SPOT is relatively cheap, compared to its competition. Similar units from the other offering manufactures cost roughly 2 to 3 times the retail value of the SPOT unit. I see them anywhere from 300 to 500 dollars in cost, depending on the features you want, all of which still require some sort of subscription. The subscription is possibly the one drawback to the overall value of the SPOT, however, I chalk it up to “cheap” insurance. At 100 dollars a year for the basic emergency service, it really is cheap when considering the alternative is to be stuck alone somewhere, left to die knowing nobody is aware of your situation. I opt for the 50 dollar option on top of the basic service that provides detailed “track” information. The SPOT can be configured to send “Check In/OK” Messages to individuals using email or SMS, it can send a “Non-Emergency Help” message to individuals using email or SMS, and of course it also has the “911/SOS” button that allows you to send detailed information of your location to Search and Rescue. The newer, Gen 2 version allows one to even send a 3rd type of message to Email/SMS. Right now, I just have mine send a message to my email that basically says “This is an interesting place”, used to mark a landmark or something that I pass. Lets move on to the review. Both of my SPOT devices, the Gen 1 Personal Satellite Tracker, and the Gen 2 Personal Satellite Messenger are tough as nails. Starting off, they are built from a pretty sturdy polymer and lined with a rubber bumper. I have dropped my Gen 1 more times than I can count. It has been knocked off of my backpack by rocks, trees and other obstacles just as many times. It always continues to work. They are weather proof to withstand water, with sealed compartments for the batteries held securely in place by d-ring stainless screws. If there ever was another device or piece of equipment that did it’s function as well as the SPOT, I don’t know of it. It does exactly what it is supposed to do, and does it well. Not a whole lot to write here besides that I’ve never been disappointed besides 1 time, but it was my own fault. When I was standing in the Arctic Ocean, I had it clipped to my belt, forgetting that technically the thing is supposed to be pointing straight up, as laying flat. So it never marked me in the Ocean. My fault, not its fault. Again, another one of those things I cannot give other than a 5 out of 5 in. It’s useful for exactly what it does, and the ease of use makes it dead simple for anyone with the ability to push the buttons to use. 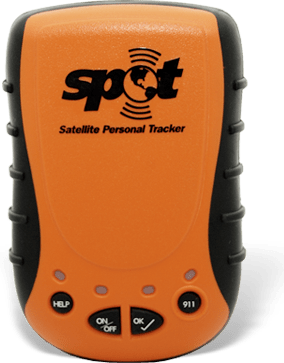 On the SPOT tracker, you have 4 buttons. A power button, a Check-In button, a Non-Emergency Help button, and a 911/SOS button. On the messenger device, you have two extra buttons, a “Tracker” button and a “Message” button and it is a smaller package. The combination of all of the features allows you to customize it pretty well for what you want it to do for you, and even add the ability to post directly to your twitter or Facebook feeds. Was there any doubt this would be a 5 out of 5 stars? It does exactly what its supposed to do. With leaving the device on, and ready to send it will stay on for an extremely long time. I know that I used mine on my trip to Prudhoe Bay and back (3 weeks) with check-ins on two fresh AA batteries put in prior to leaving. The messenger says it will last a couple months “on”. Overall it does what it’s supposed to do, does it well, and gives you some peace of mind, knowing that if you are in trouble, stuck out somewhere alone, or with someone but unable to make contact outside the area for an emergency, you have a way of doing so. It also helps give those back at home peace of mind with your check-ins. Overall, I think everyone should have one, and I understand there are those who do not wish to have a yearly subscription of 100 dollars, but in my personal opinion, it’s worth every penny.